We hear a lot about all of the “climate aid” money the UK is handing out to developing countries. And, of course, it is all totted up towards the global target of $100bn a year, which is supposed to be due by 2020. 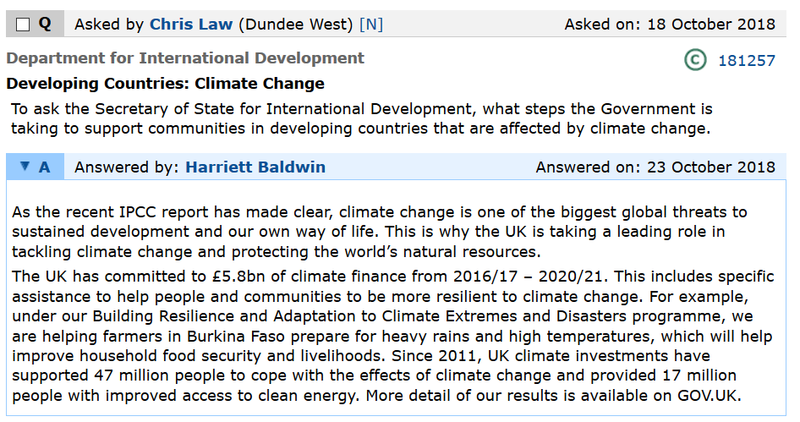 For instance, Harriet Baldwin, Minister of State at the Dept for International Development (DFID) provided the above answer to a question in Parliament last October. £5.8bn sounds a lot of money. 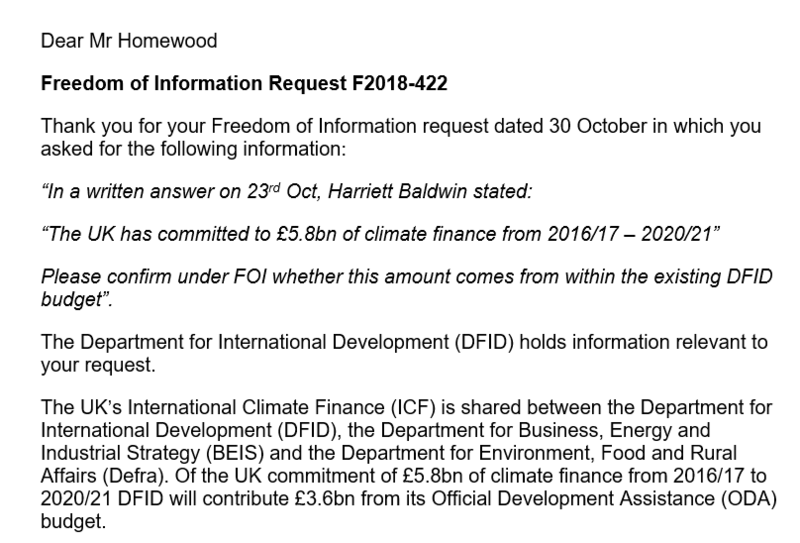 But when I checked it out with DFID, it turns out that this money is simply allocated from the existing Overseas Development Assistance Budget. In turn, the ODA is fixed by law at 0.7% of GDP. BEIS and DEFRA, who are responsible for some of the payments, gave similar answers. It is true that Britain’s overseas aid spending has increased in real terms since 2009, because of the new statutory requirement to spend 0.7% of GDP. However, this requirement was not introduced to facilitate climate funding. What is absolutely clear is that every penny now spent on climate aid has to be funded by cuts in other aid areas. It certainly cannot therefore be regarded as “new and additional”. Whether the money could have been better spent elsewhere is debatable! And what about how this money is spent? Harriet Baldwin gave the example of Burkino Faso, who she said need to prepare for heavy rains. Located between the Sahara Desert to the north and coastal rainforests to the south, Burkina Faso is prone to chronic drought, flash floods, wind storms, and disease outbreaks. In other words, the country already suffers from the problem of floods. What Baldwin is really funding is building resilience against bad weather, not climate change. A highly commended activity, I have no doubt, but nothing to do with climate. I also have little doubt that similar, weather related projects have been funded in the past, without being rebadged as “climate”. As for overall rainfall, the current 10-year average is bang on the long term mean. 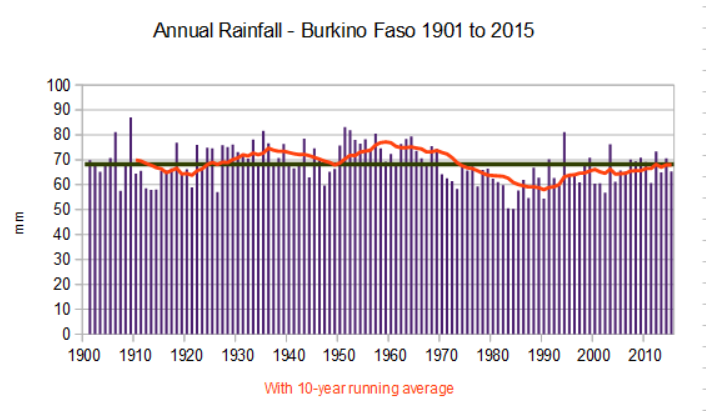 The Sahel drought, which coincided with global cooling, is evident in the 1970s and 80s. Also there was a much wetter period between the 1930s and 60s. However, rainfall levels in recent decades have been little different to the early 20thC. As for the aid money, it is questionable how much Burkino Faso will actually see. As Harriet Baldwin pointed out, the aid is channelled via the Building Resilience and Adaptation to Climate Extremes and Disasters programme (BRACED). The fat cats at KPMG and ODI will doubtlessly cream off a nice slice of the funding. Back in 2016, the Public Accounts Committee that the DFID shelled out £98m in the previous year to the Big Four accountancy companies.